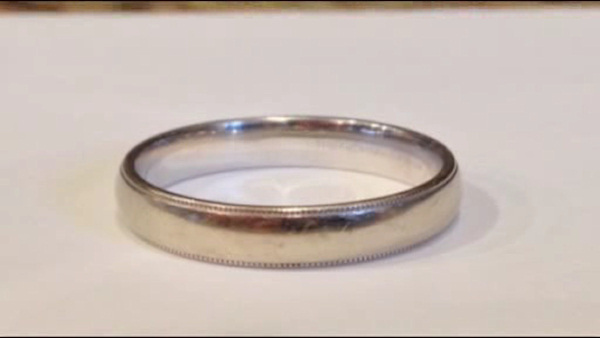 NEW YORK -- A Staten Island woman is working hard to try to find the owner of a wedding ring her husband discovered in a most unusual place. The ring was found in the pocket of some pants she ordered online. Jean Remini bought the pants for her husband online from Neiman Marcus. When he tried them on, he found the ring in one of the pockets. Now she is on a nationwide search for the owner. "This is something that is very important to someone. I know how important it is because I actually lost my engagement ring about two years ago and I still haven't found it. So this is very close to my heart," Jean Remini said. The pants were shipped from a Neiman Marcus in Tyson's Corner, Virginia. Remini hopes to give the owner a late Christmas present.